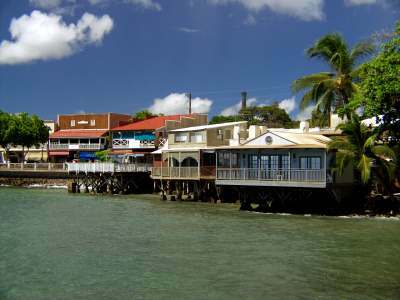 Front Street, Lahaina was the Perfect Place to go for Great Shopping in Maui! The Perfect Place if Maui Shopping is What You Seek! We thought Front Street, Lahaina was pretty cool. Shopping isn't normally my thing, but the shops of Front Street are so cute, that it's hard to resist their pull. If you're a shopaholic, look out! Front Street, Lahaina had an amazing assortment of shops all along one convenient stretch of pedestrian-friendly road: inexpensive shops selling souvenirs all the way to high-end, elegant art galleries. All you need to do is park your car nearby, then enjoy a relaxing stroll down the street as you browse (and buy!) to your hearts content. I thought it was really great to find such a range of stores all on one street. We ended up spending several hours here wandering in the shops and galleries. One of the galleries in particular had some really unique framed photos of beaches and the like. These weren't just any photos - these were HUGE depictions of the most sublime-looking beaches, framed artfully with driftwood. We were so drawn to these beautiful works of art (and that's truly the only way to describe these incredible photographs) that we came back to this gallery several times. And discovered that the prices were a bit out of our league! We finally decided that given our uncertainties about how we'd get this memento home in one piece (it was huge!!) and the fact that the prices were so much higher than what we had hoped to spend, we should pass on this purchase. But ooooooooo, were we ever tempted! As we continued our stroll down Front Street, we saw that even the ABC stores can be found here. If you're not yet familiar with the ABC stores, once you step foot anywhere in Hawaii, you soon will be. These are a chain of convenience stores selling everything from sunscreen to souvenirs to fine wine and all for reasonable prices. If you go far enough down Front Street, you'll see Lahaina Cannery Mall. You'll need to hop in your car to get here though, as it's a ways away from the main pedestrian shopping areas that I was talking about earlier. We ended up here because we had some time to kill while waiting to get into the Old Lahaina Luau across the street. I don't think it's worth making a special trip to Lahaina Cannery Mall just for sightseeing though - it's just your typical air-conditioned mall like what you'd see back home. However, that being said, they did have a lot of shops selling souvenirs, so if you like to comparison shop, it may be worth the trip. Also, they have a 24 hour Safeway in the mall - if you're staying in a nearby Maui condo rental and need to stock up on groceries, this could be handy for you. Lastly, if you just happen to be in the area like were, then you might as well look around a bit! So, as you can see, even though I have an aversion to shopping while on vacation, I still found myself doing a bit of Maui shopping. Since Front Street, Lahaina was so colourful and full of unique shops and people, I actually enjoyed it too! Anyone who actually likes shopping will absolutely LOVE it here... trust me! Do you have a story to tell about your visit to Lahaina? Click here to share with us your Lahaina story! 1) The largest tree I have ever seen in my life is just a short stroll away down Front Street... Click here to find out more about Lahaina, Maui's famous Courthouse Square Banyan tree!